The karst aquifer connecting meteoric recharge entering Bătrânului Cave on the Zece Hotare karst plateau to spring discharge arising from Vadu Crișului Cave along the Crișul Repede River provides one glimpse into aquifer processes and landscape evolution occurring in the Pădurea Craiului Mountains of Transylvania. One part of this investigation looks at the stable isotopes of oxygen (δ18O) and hydrogen (δ2H) measured in samples of precipitation, surface runoff, and spring water collected between October 2016 and June 2017. The second part of the investigation considers field chemistry, discrete samples, and continuous monitoring data collected between October 2016 and December 2017 and evaluates dissolved inorganic carbon (DIC), particulate inorganic carbon (PIC), total suspended sediments (TSS), and dissolved organic carbon (DOC) in water entering and emerging from the karst aquifer. Direct meteoric recharge accounts for 4–13% of observed discharge; most recharge enters the karst basin through infiltration into dolines and epikarst on the karst plateau. The local meteoric water line (δ2H = 7.50 · δ18O + 5.17) exhibits significant variation and seasonally shifts between recycled continental moisture (Dex > 10‰) during the fall and winter and marine-sourced moisture during the spring and summer (Dex < 10‰). In contrast, samples from Bătrânului Cave and Vadu Crișului have a homogenous isotope chemistry with a local water line of δ2H = 7.52 · δ18O + 6.00. The stability in water chemistry at Vadu Crișului is also seen in most other analytes. Monitoring data, however, demonstrates significant perturbations driven by storm events. The annual flux of DIC from this karst basin is from 1.37 × 105 to 1.64 × 105 kg/year. The annual flux of carbon increases by 12–22% when considering added contributions of DOC. Storm events do have a significant impact on mechanical and chemical processes operating in the karst basin; the addition of PIC and TSS flux increases landscape erosion rates by 1.1–1.2% and 7.9–8.3%, respectively, above the denudation rate computed by DIC alone (36.5–56.9 mm/ka). This illustrates the contributions of mechanical erosion in karst landscapes, particularly in high discharge conditions, when the flux of suspended sediments outpaces dissolved solutes. Financial support provided by the Fulbright Scholar Program and the Romanian-U.S. Fulbright Commission. Site Natura 2000 Defileul Crișului Repede—Pădurea Craiului (ROSCI0062) and Speleological Heritage Committee granted permission to collect samples from Bătrânului and Vadu Crişului Caves. The δ18O and δ2H analyses were carried out on equipment funded by the Integrated Network of Interdisciplinary Research-RICI grant no. 6/PM/I 2008 (MECS—ANCS) from Capacities Program Module I—Investment in Research and Infrastructure Development at Babeș-Bolyai University. Gregory Druschel of IUPUI and Michael Purdue and Eric Lange of BSU provided laboratory access and training. Colleagues at the Indiana Geological and Water Survey, the editors of this volume, and three anonymous reviewers improved this manuscript. Florea, L.J., Banks, S.M., Forray, F.L., 2018. 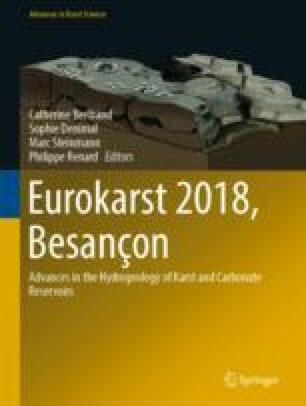 Importance of suspended sediments and dissolved organic carbon to carbon exports in karst–the Vadu Crişului karst basin in the Pădurea Craiului Mountains, Romania. Chemical Geology. https://doi.org/10.1016/j.chemgeo.2018.04.015. IAEA/WMO. 2018. Global network of isotopes in precipitation. The GNIP Database. Accessible at: http://www.iaea.org/water. Observatoire Hydro-Géochimique de l’Environnement (OHHE), 2017. http://ohge.unistra.fr, data accessed October 17, 2017.